As in his fantastic Caldecott Honor Journey and sequel, Quest, Becker has no problem telling a beautiful story with no words. His rich and detailed illustrations really need no words. Most of the characters carry a single crayon and add to the color of the world with that single crayon. Whatever they draw becomes a reality and can take them to castles in faraway lands. This book begins with the girl drawing a red door and entering. Her father finds her missing and follows her into the other realm. There they find the boy from the other books, a king, a huge castle, and also some danger. The boy draws purple birds and other creatures. As the father and daughter continue to explore, they discover cave drawings that look suspiciously like the story being told in the book. With the father’s help, the girl overcomes an evil man capturing all the different colors. 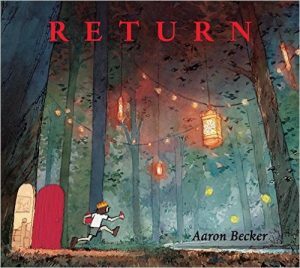 As an innovative picture book, Return encourages the reader to use imagination and observation to learn about the world and make inferences, very important to solving problems. Of course, the reader should also give this book a try if only for the pure enjoyment of the reading. With or without a teacher or parent, kids will love this book.